What is Remote Torrent Adder? Remote Torrent Adder is a handy Chrome Extension that lets users load torrents and magnet links directly to BitTorrent clients directly via Chrome without loading your web-based torrent client. In this tutorial, we will show you how to use Remote Torrent Adder in a few simple steps in order to load torrents quickly to your favorite torrent client. 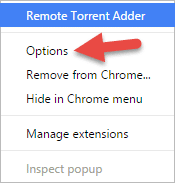 Open Google Chrome and click here to install Remote Torrent Adder extension. Click on the extension icon and go to “Options”. 5. Click “Add Server”, name it and choose the BitTorrent client you wish to add from the dropdown menu. Click “Add” to confirm. Tip: You may also remove the pre-existing “Primary Server”. Fill in the details of your torrent client. We’ll list the important fields for each popular torrent client below while the rest are optional. 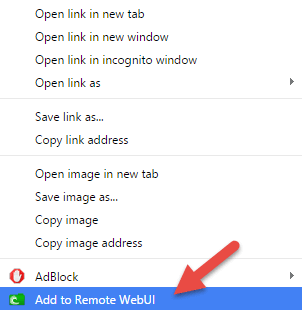 Locate the torrent you wish to load, right click it (you may also use magnet links) and choose “Add to Remote WebUI”. Tip: If you have more than one server configured, a secondary menu with the list of your configured servers will show up and let you choose to which server you wish to load your torrent on. A confirmation pop-up window will confirm that the torrent is added successfully. Your torrent should now show up in your web-based torrent client. Congratulations, you have learned how to use Remote Torrent Adder.